by Suzanne Star, art by Liz Hilton. Back of card: Purple field with yellow/gold border. In center, two unicorn heads on yellow/gold circle. Booklet included: Yes, 24 pages, 2.65 x 4.4 inches, or 67 x 112 mm. Comments: As a theme deck, this one just doesn't quite work. Merely putting a white horse with a horn jutting out of its forehead on cards doesn't make for a tarot deck, in our opinion. Looking at the booklet that comes with the deck, it seems the author & artist haven't a clue what unicorns are all about. So a set of 78 rather lame cards. As our own knowledge of unicorns is weak, before we wrote these notes we did what Hilton & Star did not: Research. We looked up "unicorn" in The Penguin Dictionary of Symbols, by Jean Chevalier & Alain Gheerbrant, translated by John Buchanan-Brown, published by Penguin, London, 1996: $19.95 & strongly recommended if you want to study Tarot. Traditionally, the unicorn is the symbol of purity, which includes virginity. But with that horn sticking out, wags have also made the beast a phallic symbol as well. This is not a corruption, but an inversion. The unicorn is both. So the King of Rods (above) shows two unicorns. Could one be pure, the other corrupt? Do you see any difference between the two? Does the king appear torn between spirit & lust? Or are the unicorns mere decoration? Looking at their work, I suspect the authors mistake unicorns for horses. Since horses are physically powerful, shouldn't unicorns be spiritually powerful? Nice idea, but no. And they're not bleached zebras, either. From the booklet: "The High Priestess is pure & virtuous...." So far, so good. Add the unicorn: "Gently trotting beside the High Priestess, the unicorn (who is attracted by her beauty [!]) follows & protects her from any danger with his spiritual strength." Folks, that's ignorance. Since everything imagined as well as everything that can be imagined exists somewhere on astral levels, unicorns, too, exist on higher astral levels & can be contacted & known on those terms, along with dragons & toads & the witches that open the third act of Macbeth, they're all out there on the astrals somewhere. The creation of a tarot deck, even a poorly done deck like this, requires months or years of work. All this work means concentration. It's virtually a law of metaphysics that when you concentrate on something, information about that something comes, generally from astral levels, like it or not. 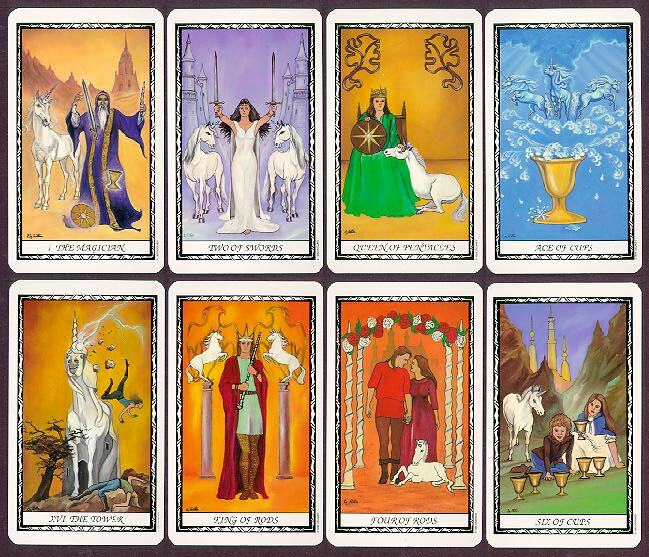 For this reason, tarot decks, no matter how strange, are usually artistic creations of a high order. So the failure of both artist & author to create something interesting is all the more noteworthy. We hate people who say, "Buy this, it's a collector's item," but in this case, it's true. Cashing in on a unicorn fad, the authors have produced a deck of slight value. When unicorns fade from the pop culture, this deck will likely be discontinued. As tarot decks go, it would not be a great loss. As an icon of a particular moment in time, this deck may have increasing value in the decades to come.